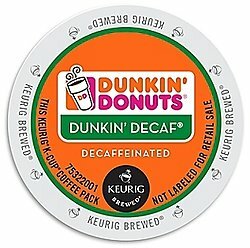 Dunkin' Donuts - Decaf K Cups (24 Count). An authentic Dunkin' Donuts experience, only decaffeinated. The same rich aroma and flavorful coffee without the caffeine. Each box contains 24 single serve K-Cups for office coffee.